The views of Lake Pend O’reille from the Long Island are spectacular! There is room to park 2 cars at marina and room for another car as well as boat/jet ski trailer across the street from marina. Cell and WiFi connection is spotty at times due to location. WiFi connection is spotty at times due to location. Life jackets are available for renters. For just two of us we had plenty of room and supplies such as towels, blankets, pillows, etc. Owner was out of town, but Jon and Dave took great care of us, even when we had to wake them up Saturday morning when propane ran out and we had no hot water. They had it fixed in about 15 minutes. Getting rocked to sleep every night was just what the doctor ordered, although when the wind picked up and whistled through the windows, it did keep me on alert, although hubby slept through everything. We paid the extra fee for the tour around the lake, and it was spectacular... very romantic. We felt like royalty sitting up on the upper deck drinking wine and eating the snacks we had prepared for the trip. The purpose of this trip was to get away without our kids, but we definitely want to return WITH them next time, and in warmer weather, as we're quite sure that they will love the slide, kayaks, and paddle board opportunities. We also enjoyed the Floating Restaurant at the neighboring marina, and there are gas, groceries, espresso, only 8 miles away if in a hurry. If wanting more elaborate shopping or concerts, etc, then Sandpoint is also a fun place 20 minutes away. 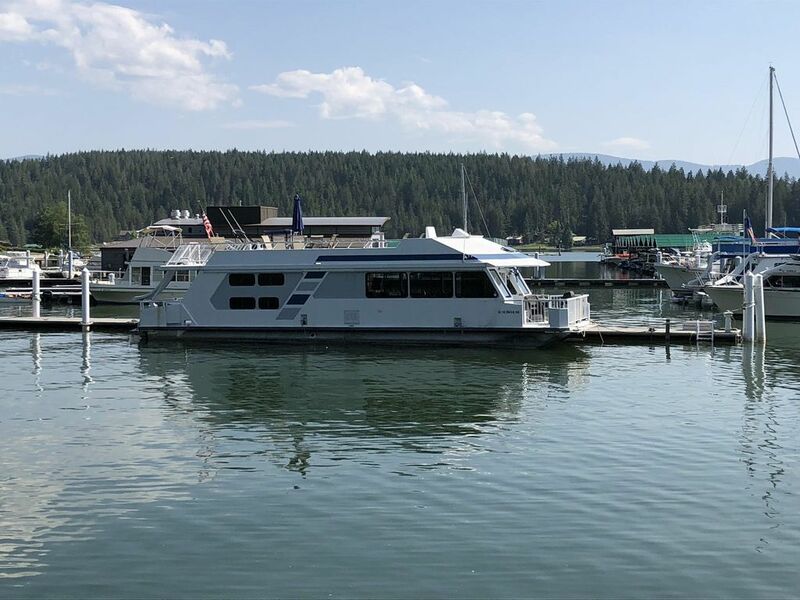 Highly recommend this getaway, although would caution if coming with a bigger group to plan on using the bathhouse for showers, as the one bathroom on the boat is tiny and could get crowded in a hurry. had everything needed. rooms are about same size as beds, but that's to be expected in a rv on the water. tv would be nice to have, wasn't sure if it was an option or not. lots of dvd's. I think wifi was an option, but couldn't remember if it was or not, but nice to have if no tv. Thank you for your feedback, Robb. Much appreciated. We had a great time. Joey was so chill and easy to talk to and his boat is in great shape. We really loved the kayaks and the slide. We spent 6 days there and spent most of our time on the houseboat, this trip was a lot of fun. Thank you so much for the positive review🙂� I am glad you and family had a fun and relaxing time during your stay. Enjoy the rest of your summer. We had a wonderful family weekend. Clean, everything we would ever need, and so much fun. Curt was awesome at helping us find it and answered any questions we had. Great experience and would love to go back! This was one of those vacations that you dream about; Watching the sunset from the deck, early morning Kayak trips, hot coffee on the back of the boat, every thing you could want Joey has supplied on The Long Island houseboat. Beds were comfortable, Great videos and music for entertainment, the slide is a blast, and the water toys got a constant workout. The kitchen is fully stocked and we used the grill on the back deck every night. We will be coming back here, we haven't been able to relax like this on a vacation for a very long time. Joey is a great host, and his neighbors are the best. This boat was very fun to stay at and Joey and Curt were easy to work with. If you get motion sick I recommend bringing Dramamine, but as long as you take that it’s great. Beautiful views and relaxing environment, would definitely recommend staying here.